Is anyone really surprised anymore? It’s worth noting that whatever internet connection supports Bell’s iPhone in Whitehorse is alive and functioning perfectly well this morning. I’m tethered to it with full access. Northwestel Limps Back to Life…? Apparently an “intermittent link” in Whitehorse was fixed yesterday. Things are reasonable again. 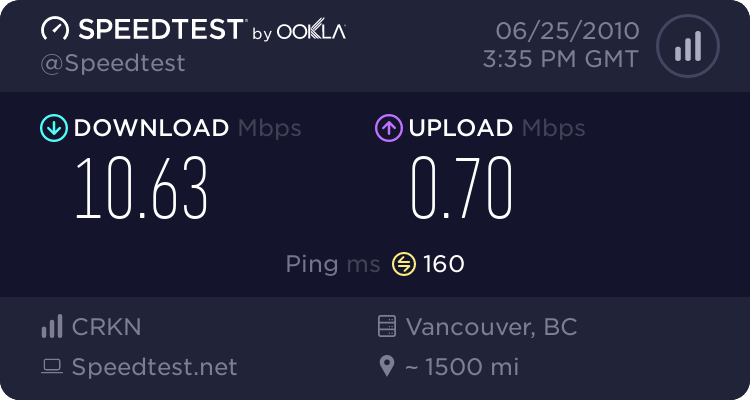 My download speeds are running at about 66% of Northwestel’s promised rate. But web pages load fast again, and latency is down to an acceptable level. Well done, Northwestel. Thanks for fixing that. Sorry, you’re right. I’ll just be satisfied that my three days of public whinging paid off. Now to make up for the lost time suffered this week as a result of this service disruption. Oh, happy Friday! We’ve all watched the scene. A secondary character in a primetime TV show quietly bites the dust in a hospital bed. The doctor pulls a sheet over his face. The detectives stand around, mournful of that last piece of information the dead guy failed to expel with his dying breath. A random, anonymous nurse steps away from the foot of the bed to reveal a tag tied to the corpse’s toe. Then she hands a piece of paper to one of the detectives for a signature. When the sheet is promptly returned, the nurse efficiently files it away in a folder. Last week the blog platform I use, WordPress.com (the one you’re currently reading these words on), suffered some downtime. The people who manage this platform went beyond just fixing the problem. They told us what happened, what they did to fix it, how long it took, and what they’re doing to try and prevent another similar occurrence in the future. You can read their blog post here: Downtime. That’s great customer service. And it’s for a service that’s totally free. Now compare that to how Northwestel handles its outages. They provide almost no information, avoid even acknowledging that anything happened (it’s that maybe nobody noticed mentality), rarely explain what happened, don’t offer information about how they recovered from the outage, and provide no assurance that they’re working to avoid similar outages in the future. That’s awful customer service. And it’s for a service I pay $90 a month for. It would be both refreshing and encouraging if Northwestel made an effort to communicate these matters to its customers. It would provide an assurance to us that we can depend on the company to work in our interests and in the interest of providing quality services. Instead, when the company hides behind a wall or buries its head in the sand over these issues, one begins to lose trust, faith, and wonder what the company is hiding. This is interesting. Working online over Northwestel Cable today in Whitehorse is nigh-on painful. 30 seconds to download web pages is the norm. Just for fun, I switched over to tethering my Mac to my iPhone for internet access and saw a marked increase in network performance. It only takes a second or two to download the same pages over my iPhone’s data connection. Obviously, the bandwidth is much more limited, but notice the ping time. 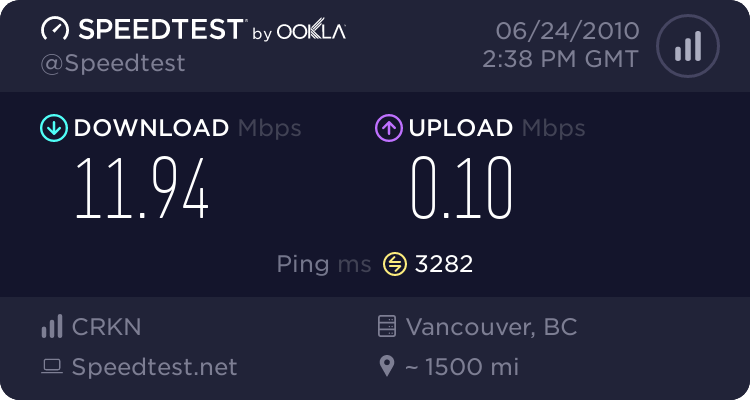 That’s less than one tenth of the ping time over Northwestel Cable today. And, as I mentioned in my previous post, that’s what making the difference. It’s clear that Northwestel Cable’s issues today are latency-related. A traceroute reveals that the Bell Mobility data traffic is being routed through Vancouver, presumably over the fibre. Which begs the question: why isn’t all traffic going out over Northwestel’s BC fibre? Why is Northwestel Routing Whitehorse Internet Traffic Through Yellowknife? You can see that download speeds are improved, but the Ping time is abysmal. I would normally expect a ping time under 100, or about a tenth of a second; that 3282 ms ping time is over 3 seconds. A poor ping time often points to a routing issue. Which, even when there’s good throughput, can negatively effect delivery of packets to a client. It’s like, even if you have a really fast car, if the road to your destination is poorly defined or too circuitous, no amount of speed will get you there quickly. And, indeed, something is going on in regards to the route that packets are travelling in and out of Whitehorse. I did a traceroute to the server that hosts Northwestel’s website in San Jose, California. (What? you didn’t know Northwestel doesn’t trust its own facilities for web hosting? Hm. Sorry to be the one to burst your bubble this morning.). Check out line number 3. I get an abysmal ping time of 3884.472 milliseconds from that router. That’s over 3 full seconds. That server, IP address 205.234.44.221, is listed as being located in Yellowknife. Which is weird because, holy cow, I thought there was this amazing fibre optic pipe that went through BC that we were all on. Anyway, as you can see in the traceroute above, there’s a block of 5 routers that all have absolutely terrible ping times: 4114.462 ms, 4049.268 ms, 4745.705 ms, and 3761.709 ms. Those routers are located in Yellowknife, Yellowknife, Toronto, and Toronto, respectively. At least that’s where Northwestel and Bell have registered them as being located. My guess: Northwestel’s illustrious fibre is still down. It’s been down for days. And the company is routing us all-the-way-for-the-nearest over through Yellowknife through a group of routers that, for some reason, are very unresponsive. And, while the bandwidth may be okay, the routers along the way are either half asleep or overloaded with the additional traffic. And that’s causing the slow-down. Methinks that maybe, just maybe, the design of the fibre route is so FUBAR that we’re in for a long summer of slow internet in the Yukon. Never mind apparently failing to share information with its parent company Bell, Northwestel seems to have a pretty deficient internal communications system, too. Whoever’s managing the company’s Twitter feed posted that a cable cut disrupted service yesterday. Unfortunately, that person seems to have chosen not to share this information with other people in the company. 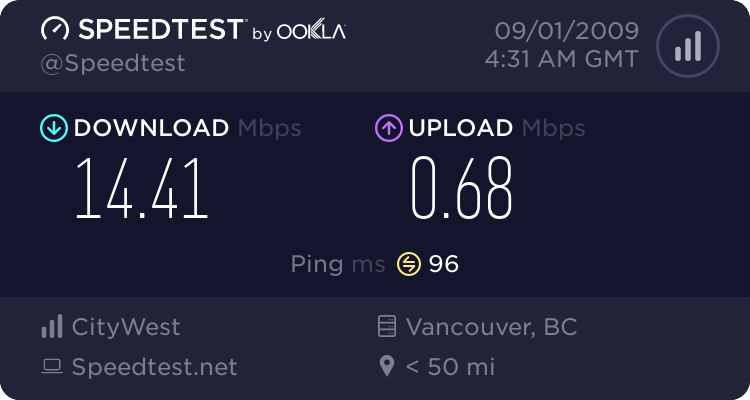 Since service levels do not seem to have recovered since that event (it’s taking upwards of 30 seconds to load web pages today), I called Northwestel’s customer service line to ask for more information. The customer service rep I talked to was caught flat-footed. He didn’t even know that a cable had been cut or that service had been disrupted. When I mentioned the tweet he went silent. I felt sorry for the guy. I’d inadvertently blindsided him with information that his managers should have prepared him to respond to. But instead he was completely off guard and unable to provide me with any information at all. Smooth, Northwestel. Real smooth. You’re a tele-what company? 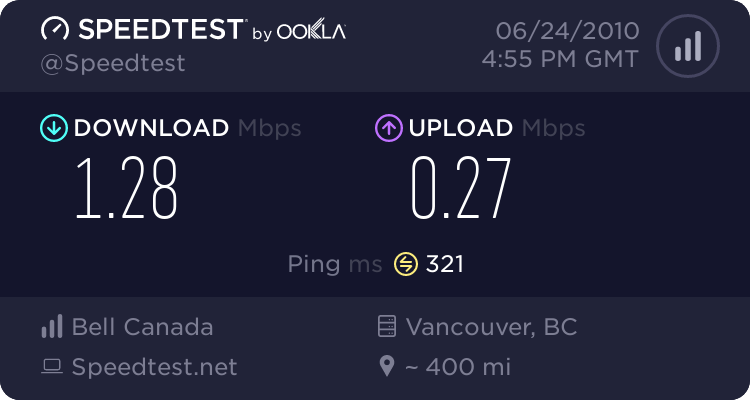 Northwestel’s Fibre Ain’t What It Used to Be (Already). 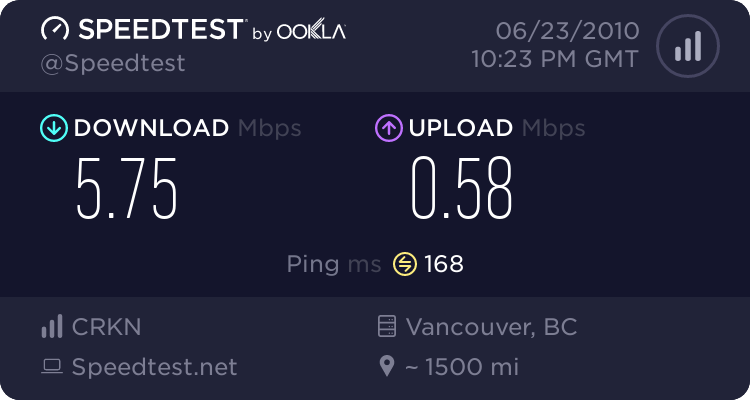 Performance on Northwestel’s much-heralded fibre optic link to the rest of the world has already degraded beyond what we used to get back in the Bad Old Days. So I guess that makes these the Bad New Days. There have been numerous cuts to the fibre since it was introduced. Considering the extreme degradation in performance that the service is experiencing, one can only assume they are patching it back up with duct tape. It’s kind of scary. At this rate we’ll all be back in analogue modem territory again before we know it.